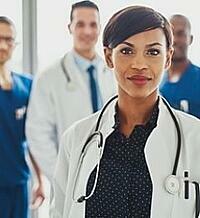 Why does having a sense of satisfaction and fulfillment as a modern doctor seem like such a struggle at times? There is an invisible battle going on, day-by-day between our search for a Fulfilling Career in Medicine and the hidden forces of Physician Burnout. In this article, I will outline why this is most certainly not a “fair fight”. Modern doctors are programmed to burn out ... it's a setup. I will also share latest physician burnout research evidence on what you can do to even the odds. What is Physician Burnout Anyway? We each know what it feels like to be burned out, toast, fried and spent after a long weekend of call or a tough night in the hospital. If you are able to recover your drive and energy before you return to work, great job. I hope your resilience continues. The difference between Stress and Physician Burnout is this ability to recover in your time off. Physician Burnout begins when you are NOT able to recharge your batteries between call nights or days in the office. You begin a downward spiral that has three distinct symptoms. You are emotionally drained, depleted and worn out by work and not able to recover in your non-working hours. This is the most common symptom of burnout by far. When burnout prevalence surveys identify the percentage of physicians suffering from "at least one symptom of burnout" - this is the most common burnout symptom. The Development of a negative, callous and cynical attitude toward patients and their concerns (“my patients are so #%*&!”). The cardinal sign here is cynicism, sarcasm and feeling put upon by your patients. The tendency to see your work negatively, without value or meaningless (“what’s the use?”) and see ourselves as incompetent. Another piece of internal dialog at this stage is, "I'm afraid if something doesn't change, I am going to make a mistake and someone is going to get hurt." The standardized questionnaire measuring these three scales of physician burnout is called the Maslach Burnout Inventory (MBI). Christina Maslach herself describes the experience of burnout using the language below. Note she was not talking about doctors at the time of this quote. Physician Burnout can be thought of as one extreme of a continuum with Physician Engagement on its other end. The feelings associated with full Engagement in your career are ones of fulfillment and satisfaction. You feel your work makes a positive difference in people’s lives and your career has true meaning. Engagement is the emotional gold standard for career success and at the opposite end of the continuum with physician burnout. The forces of physician burnout and physician engagement are in daily conflict with each other. Much of the battle lies outside of our normal awareness. While we focus on our patients and their issues, our practice environment is filled with invisible stresses that constantly pull us toward the physician burnout end of the continuum and actively block our experience of engagement. Left to our own defenses, the average hard-working doctor is at a significant disadvantage in this battle. When we are dealing with physician burnout, it’s not a fair fight, plain and simple. Let me lay out some of these physician burnout building blocks so they are in plain view for all of us. Each of these physician burnout supporters is a daily stress of practicing medicine that exists in addition to all the work you do to maintain your clinical skill set. I call these “invisible” because they are not WHAT you do at work, they are built into HOW you deliver your services. Imagine a boxing ring. Bright lights in your eyes. The noise of the crowd filling the stadium in anticipation of what is to come. You are sitting in your corner, gloves on, nervous, waiting for the bell to ring to start the match (your work day). Physician Burnout is over in the opposite corner, smiling at you with a look of calm confidence. Burnout is a lot smaller than you thought … with a reputation for tenacity and powerful body punches. Suddenly you notice a whole host of trainers, coaches and support staff in the physician burnout corner. What the … ? Here is a partial list of the invisible daily stresses who make up the team in burnout’s corner. The “most stressful” professions are characterized as having a high level of responsibility and little control over the outcome. The practice of Medicine certainly fits that description and is consistently on the short list of professions with the highest inherent stress levels. This is a tough job that saps our energy every single day. Our days are filled with intense encounters with sick, scared or hurting people … with all the emotional needs that come with an illness. This naturally draining environment is compounded by our typical lack of training on how to create and maintain boundaries with our patients. Medicine has a powerful tendency to become the “career that ate my brain”, pushing all other life priorities to the side. Our training reinforces our innate workaholic tendencies. As we get older, with more family responsibilities, the tension between work and our larger life is a major stressor for many. Lack of training in how to create and maintain boundaries – this time between work and life – is a part of this perfect recipe for physician burnout. We are the “bottleneck” in the provision of services on this same healthcare team,. The team can only go as fast as we can – and we are often behind schedule. Pressure mounts to perform at full steam all day long. This non-stop pressure is a key factor in physician burnout once you are in practice. We are isolated from the rest of the patient care team by the exam room door. We don’t know what they are doing and they don’t understand our situation simply because the majority of care occurs behind that closed door – when we are one-on-one with our patients. The financial incentives are confusing at best. The patient is often not the one paying for our services and many of them receive their care with no personal investment on their part. 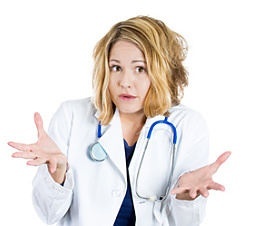 You may have to deal with over a dozen health plans with different formularies and referral and authorization procedures … of which the patient is blissfully unaware. The hostile legal environment causes many us to see each patient as a potential lawsuit. This fear factor adds to the stress of all the points above. Documentation requirements are a constant work overload. What you have to do – and document – to get paid is a game where the rules are always changing. Who am I Working for This Week? The ongoing wave of practice consolidation in many metro areas means you could be solo this week and working for the hospital the next. These shifting organizational structures can destroy years of effort invested in building your work team and profitability. The ten year threshold when your practice suddenly seems to become much more of a “mindless routine”, losing its ability to stimulate your creative juices each week. All of a sudden it seems as if medicine is “no fun any more”. Physician burnout can quickly grab the upper hand. WOW, that is a long list – and I am just getting started. What are we bringing to this fight? What is our personal motivation to take on this opponent and think we can hold physician burnout at bay? Let’s look at the scorecard. And before I show you the statistics, let’s just say … it aint looking so good. 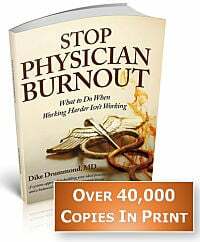 Numerous global studies involving nearly every medical and surgical specialty indicate that approximately 1 in 3 doctors are experiencing physician burnout at any given time with some studies showing physician burnout prevalence as high as 60%. Increase rates of physician substance abuse, suicide and intent to leave practice. How can you tip the odds in your favor and Beat Physician Burnout? What can be done? Is physician burnout an inevitable consequence of the choice to become a doctor … immutable, like gravity? Not by any means. The day-to-day nature of the battle between Physician Engagement and Physician Burnout mandates a role for active prevention, regular monitoring and aggressive treatment. 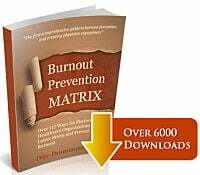 Recent research shows the efficacy of specific burnout prevention and treatment measures on both the personal and organizational level . Many of the negative consequences of physician burnout have direct bottom-line implications for provider organizations. Any decrease in physician burnout should produce measurable increases in quality of care and patient satisfaction in addition to lower malpractice rates and physician and staff turnover. Each of these effects of physician burnout reduction would be expected to create sizeable increases in profits. There is a natural place for physician burnout prevention at the organizational level.Recent research shows us what that might look like. Burnout is waging a constant, invisible, soul eroding battle with our healthcare providers. Physicians engage this enemy every single day and research shows one third of us end up among the walking wounded. 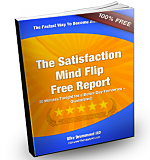 It is time to share the research proven tools to tip the odds in the favor of Engagement, Fulfillment and Career Satisfaction for our men and women “in the trenches” of modern medical practice. 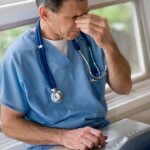 What are your thoughts on, and personal experience with, physician burnout?